Lowered Cannon Mount II - Anybody planning to USE? I'm picking up both Nuke Accelerators 3 and CL-4. Both do what they are supposed to. Lowered Cannon Mount II seems like it has just as many negatives (lowered speed and range) as positives (better defense). Do we think we need that much more defense for next time???? What are folks thinking about this special. May be useful on Shrikes for extra def when they stop, surface and fire, but looks like rubbish for on Erads imo. Im trying to speed mine up a bit to outrun throwers, not slow down and get my face scorched. Good point, something to keep in mind IF I ever build a Shrike. I looked at a build in the ship yard with the lowered mount, nuke 3 and CL4 - brought up my read defense to 98% and the Ball to 97% - damage was over 2 million per hit. I, for one, am going to use all three. Shrikes move underwater. Can afford to be slow. The positives on the blueprint all stack with all my other specials on my shrike designs. Hyper30 lowered canon2 cl4 and 4 ferrous. New launcher special and old special from the hydra . And siege battery 4. 3 limited stalker launchers on each 5 as i have 15 and 3 normal shrike launchers. Thats my design for completion after vxp suicide ranking and on paper it looks like an auto target beast of a tank. Wish it got them launchers more dmg too but just ballistic so ?? tried no engine with the eradicator, ended poorly, couldn't get the stacks but SHrike doesn't have that problem AND he's got the Hyper 30 on there for +30% speed. That build has 24 combat speed. 98 to all resistances 65 evade and 30 splash reduction. 25% speed boost from flag Solons. 24 + 1/4 24. 24 +6 = 30 combat. 100% speed boost underwater so double that when its on the move. Ive used all normal launchers incase most of the community doest have at least 15 limited launchers. If you do add 3 to each ship and the resistances go from 97 to 98.
slow no engine tanky shrike design. dont forget it gets 100% ( double speed) underwater when its moving and cant be hit by flamers or any other turrets while on the move as mod confirmed there is no detection. i build it for evade and resistance and splash damage reduction when it surfaces and makes itself a target. it doesnt have to run around the target on the surface at high speed to outrun the flamers. It functions like auto ship.. move stop fire and repeat... so might as well design it to be the auto ship..absorb lots of damage as its a sitting duck when its firing.. reduce flamer splash by 30% and reduce damage by 97/98% and avoid up to 66% of incoming bullets i hope. Can't tell if being sarcastic but that +50% evade will be helpful there are some accuracy based turrets in the target. not being sarcastic, it will reduce damage a lot. Why would anyone use a ballistic special on a luncher hull with lunchers on? Another problem is -40 speed, that would disqualify it in most of the current targets. Hey Everybody! Hydra's just got buffed up to a whole new level, good thing! Here's the updated build, hope it helps! ... because we want 50% evade and 35% to both relevant resists for literally no downside? Now now loco you slacking mate... tut tut. You forgetting... very useful projectile speed and the 100% building damage too. Give the guy the full picture so he can start to learn how to be a better shipbuilder or understand ship design mechanics. That's not a good build. LCM2 does not suit hydras at all because it slows it down drastically. You want the combat speed. I understand if you want to keep the limited charged armor on for Legion Colony targets, but for max efficiency do all C1-CR. Siege Capacitor is not the capacitor to use. Aegis is the way to go. Less flechette damage increases the amount of shockwaves you can get off a single turret, which will help damage anything around it more efficiently. It also beefs up resistance more than anything else, without compromising speed. You don't need to outrange throwers if you can outrun the shots. Actually to outrange the throwers you don't want speed. You should not build to outrange the throwers. It takes too much effort for not much reward in terms of damage reduction. One lag spike and all your efforts are for nought. You can just as easily blitz past the pyro turret without taking damage, letting it empty its salvo then swinging back to kill it once it has expended all its ammunition. It's more consistent, easier to do, takes less time, and is more resistant to lag. that build is invalid now, kix doesnt allow LCM2 and Hyper 30 to stack anymore. I passed that bit up to see if it is intended or what is going on with it. 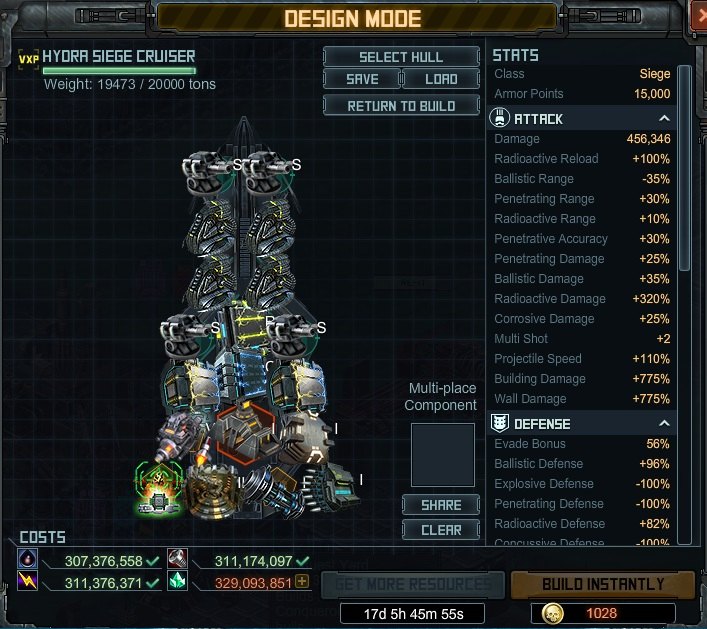 So there was a hotfix to correct the stacking with Hyper30 and Lowered Cannon Mount 2. They can now both be equipped to the same ship once again. My build is viable once again. what about seige targeting? if we put on this new canon special we can not put on seige targeting ... i thought the big tip from kix said we need most building damage possible ... can we afford not having seige targeting ? same build with seige targeting is more damage for less evade and defense ... which is better ?